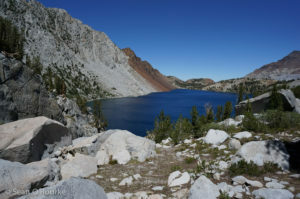 Convict Lake is surrounded by some of the most colorful, rugged, and rotten peaks in the Sierra, including the north face of Mount Morrison, which looms over highway 395 south of Mammoth Lakes. “Mount Mendenhall” is an unofficially-named summit west of Red Slate Mountain, a giant pile of red scree with a classic couloir climb. Given the surroundings, I was not optimistic about what we would find as we set out past the boat launch at 6:00. 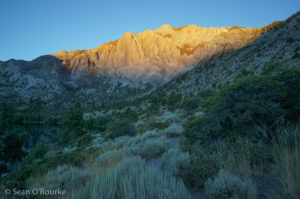 Loren immediately took off running at an uncivilized pace for the hour; I tried staying with him for about 30 seconds, then let him go and admired the sunrise on Laurel’s northeast face. Most of the way around the lake, I decided to make things fun. Where the trail crosses the wash below Laurel’s face, I left it to reach the base of the northeast gully, a classic 4th class (or maybe 5.2 these days) scramble that, because it follows an avalanche- and flood-gully on the face, is the only clean route on the peak. This would be another test of my 1.5-handed climbing, but I felt reasonably confident after the previous day, and needed the fun. From Laurel’s summit, it looked like I could follow a ridge around to Mendenhall, crossing Bloody and an unnamed 11,981-foot summit along the way. Since John Mendenhall had made the gully’s first ascent (the first belayed climb in the Sierra), this also gave the day a pleasing symmetry. 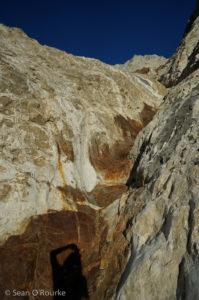 The gully is mostly sticky class 2-3 slabs, with some waterfall steps and constrictions passed by either climbing to one side or stemming up the center. I was a bit slow on these crux sections, but figured out alternate left-hand-dominant sequences without much trouble. Where the gully splits lower down, I took the right branch, then stayed in what felt like the main watercourse where it broadened and flattened. When I last did the route in 2009 or 2010, I somehow got out of the gully onto crumbly, black, scary rock to one side, and therefore found the route only so-so. This time I managed to take a better line, coming out just north of the summit with only a bit of unpleasant scree-slogging. I was pleased with my time of about 2h05 until, leafing through the register, I saw that Jason Lakey had recently done a 1h47. That is a solid time for 4000 feet of gain on technical terrain, especially padded with a mile or so of flat trail around the lake, and I’m not sure if I could best it, even rested and two-handed. It was a good reminder that there are plenty of quiet fast guys out there. From the summit, I descended south toward Bloody Mountain, eventually picking up bits of boot-pack that were much more helpful going down than they would be going up. 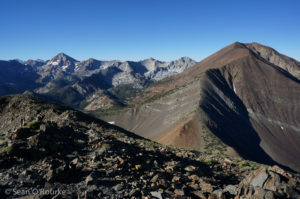 I crossed the Dorothy-Laurel trail at the saddle, then picked up a better trail along the standard route up Bloody’s northeast ridge. After more than enough false summits, I reached the true one, from which I saw that the route forward looked a lot of up and down. According to the register, my route up to this point had been reasonably popular; the remainder was probably not. 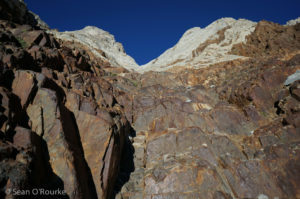 The descent southwest from Bloody was generally unpleasant, with few opportunities for scree-ing on the loose slope. 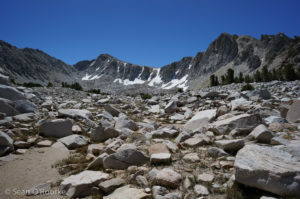 The rock changed from red slate to white granite near the saddle, from which I spied a group of four backpackers making their slow way across the pass between Bloody and Edith Lakes. From the climb up to Peak 11,981, Bloody looks like a nice granite peak with nasty red scree poured over it as a topping. I reached the summit with the usual class 2-3 on mostly decent rock, signed the register, then continued south toward Mendenhall. 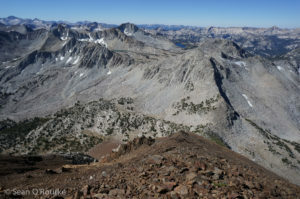 The connecting ridge drops to a saddle around 11,400′, then becomes more difficult as it rises again. For speed, and because I was low on water, I dropped to the valley near Franklin Lake, making good time past several lakes as I approached Mendenhall’s north face. Though it looks like a horrid mixture of dirt-chutes and rotten ribs above a long moraine, I found a decent slabby rib and some stable talus most of the way up, with only a bit of loose struggling near the top. I emerged just west of the summit, then hiked up to find Iris and Chris hanging out, unhurried as usual. Both Iris and her clothes seemed held together by tape, a bad sign so early in the Challenge, but she seemed cheerful enough. Since I was out of food, I gladly accepted their offer of trail mix and wasabi peas, shunning some plantains, and talked for a bit before joining them in descending toward Dorothy Lake. They seemed in no hurry, even planning to swim in one of the lake; sensing an irreconcilable difference in style, I left them on the sand descent. I overtook and talked to the other Sean in the forest above Dorothy Lake, then started jogging on the trail around the surprising mile-long natural lake. I caught some others on the descent past Mildred, finally chasing down Bob just above the stream crossing. Despite wearing cheap hiking boots, he usually runs such descents, so I was surprised to find him moving at a moderate walk. It turned out he was having some toe problems, which I tried unsuccessfully to convince him might have something to do with the boots. Bob being Bob, he convinced me to try to catch Rob, who was jogging the trail a few minutes ahead. After crossing the stream with less desperate shenanigans than I remembered, I took off down the rocky trail faster than I had planned. I finally saw my prey ahead on the long hike around the lake, jogging the downhills and flats, and walking the uphills. Right as I caught him, he looked back and took off at a genuine run. I accelerated to hang on, and we both finished the last quarter-mile panting. Rob has an unnatural amount of speed and enthusiasm for a 59-year-old man.